12' 10" - 15' 8"
The patented and exclusive AccuSection Control (ASC) system helps you get the most out of your inputs and enhance yield characteristics by shutting off rows or sections to avoid over-seeding and over-application of fertilizer. Using AFS AccuGuideTM autoguidance, the system turns off air drill sections automatically when you enter areas that have already been seeded, or at headland turns, point rows, ‘prairie ponds’, and sloughs. Growers who have upgraded spraying equipment to include section and nozzle control systems have realized savings on product use – ranging from 7 to 15 percent. The quick-attach connection system simplifies all hydraulic, electrical and primary line connections at the hitch, using stainless steel pipe connections and convenient over center latches. A bridge frame construction delivers maximum strength and maneuverability. With both narrow and wide configurations, the Precision Air cart's frame provides good flotation and stability. The air cart's hitch options allow it to be towed directly between your tractor and drill or behind your drill for better visibility. Tow-Between and Tow-Behind tire flotation packages are designed to keep going in the toughest conditions and reduce compaction for higher yields. 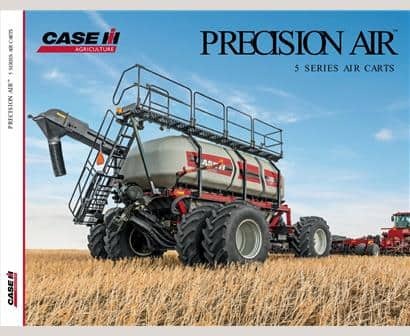 Ready for use with ISO 11783 technology, the air cart is developed to work with the Case IH Advanced Farming Systems (AFS) Pro 700 control center. This 10.4 in (26 cm) color touchscreen enables simple and easy monitoring and operation of meters, section control technology applications, bin level and other air cart sensors. The Precision Air 3555 has a new master shut-off feature that allows for meter servicing without having to empty the air cart's contents. The Precision Air 4465 has larger tank openings, low-profile lids and heavy-duty interior ladders provide easier access for operators, while a new over-center tank lid lock system ensures a tight seal. From new technology to maintenance guides and field reports, the Case IH Blog is your resource for timely seeding tips and information. Is Your Air Drill Ready to Seed Wheat, Cover Crops? ​Compare our air cart specs to other manufacturers' specs.